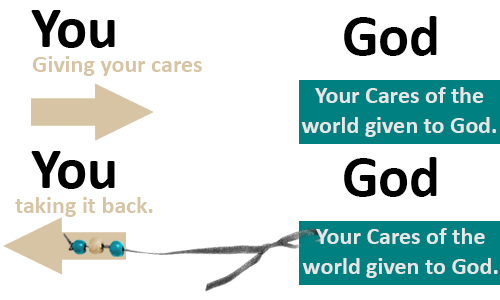 Are you casting your cares with strings attached so you can pull them back or are you casting your cares on God and trusting on Him, relying on Him and confident that God will look after you? 1 Peter 5:7 Casting the whole of your care [all your anxieties, all your worries, all your concerns, once and for all] on Him, for He cares for you affectionately and cares about you watchfully. Comment below… How do you do this? Posted by Mandie on January 18, 2015 in Perfecting Your Runway Walk and tagged 1 peter 5:7, Casting you care, Choices, Christ Jesus, Christian, christianity, essentials for life, fishing, God, Holy Spirit, Jesus, Life story, little black dress, Mandie, spirituality, strings attached, Word of God, YouTube. So I thought I would start the comments on the question I asked above. How do you cast your cares? This is sometimes really hard actually most of the time it’s hard to let go of those things that you care about and to give control away. I have to say if I’m really struggling with the issue I need to cast on God or Jesus, I get into the word of God. A lot of times I’ll meditate on first Peter 5:7. Often times imagining myself throwing the care is far as I can in my mind and after I’ve done I’ll often times meditate on Psalms 138:8 which says “the Lord will perfect that which concerns me” And “I let the peace of God rule in my heart and I refuse to worry about anything” (Colossians 3:15). The last part that says “I refuse to worry about anything” is something I like to say it is not in Colossians 3:15. Love to hear from you on how you cast your cares upon Lord.